This is what this man seems to be saying as he shows this young boy Prime Minister P.J. Patterson, who was touring the Denbigh Agriculture Show on Emancipation Day. The winners for August 15, 2005 - October 31, 2005. Caption: Smile nuh bwoy - a election time an wi road wann fix... mi seh smile before mi pinch yuh! Caption:"See Son even the Prime Minister picks his nose too." Caption: Suh daddy a dis yuh stop mi from school fah? Caption: ...daddy, what\'s a Crime Minista? Caption: A picture of hope. A father fathering his son. 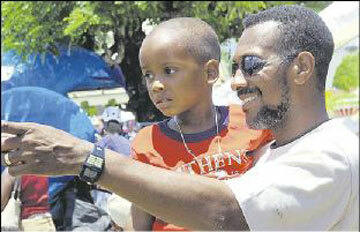 Caption: Son i waan u fi grow up and be like him the next prime minister. Caption: do i really look like him son? Thank you for the 245 responses we received. Enter again and we hope you will be the outright winner next time.